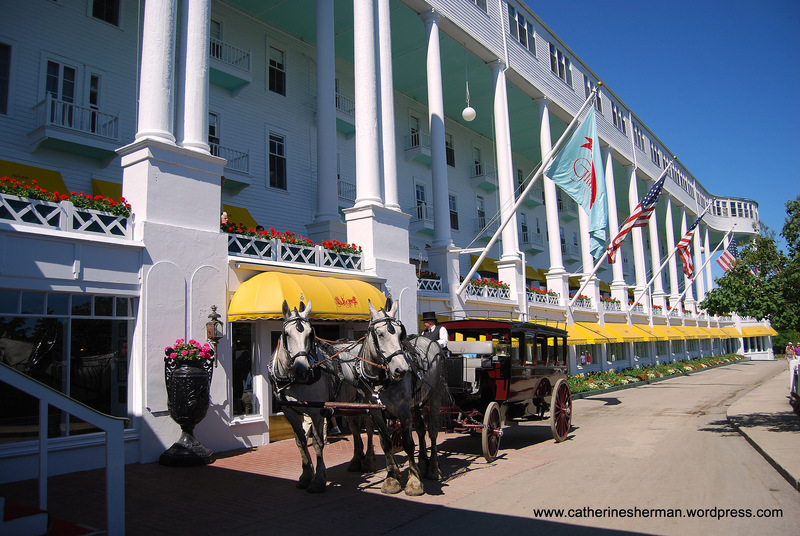 Horseback riders pass the Grand Hotel on Mackinac Island, Michigan. Opened in 1887, the Grand Hotel is the largest summer hotel in the world. Motorized vehicles aren’t allowed on Mackinac Island, so everyone walks, rides bicycles, takes a horse-drawn carriage or goes on horseback. 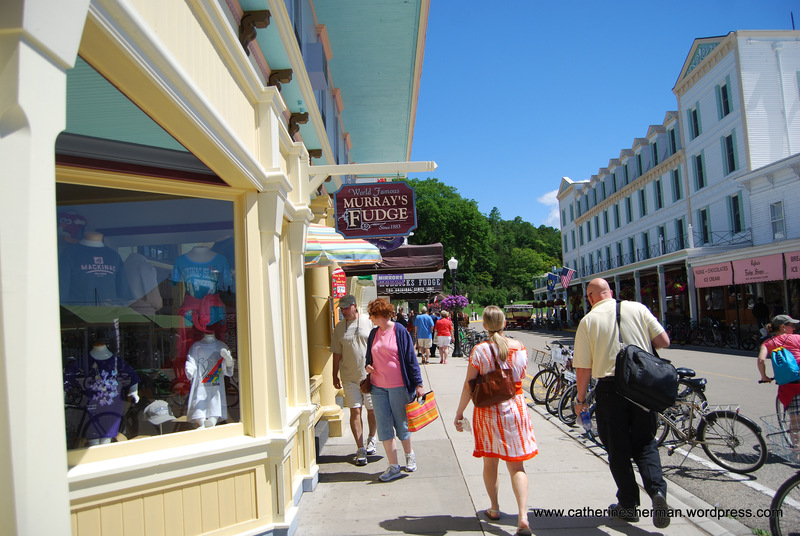 This June, I finally visited Mackinac Island, Michigan. I’ve wanted to visited Mackinac Island, Michigan, and the Grand Hotel, ever since I saw “Somewhere in Time,” the 1980 romantic time-traveling movie starring Christopher Reeve and Jane Seymour. (Thanks to my husband. He did all of the driving.) What took me so long? The island and the hotel are fabulous. The island is definitely a trip back in time. No motorized vehicles are allowed on the island, except an ambulance and a police car and snow mobiles in the winter. People get around on bicycles, on horse back, in horse-drawn carriages and on foot. 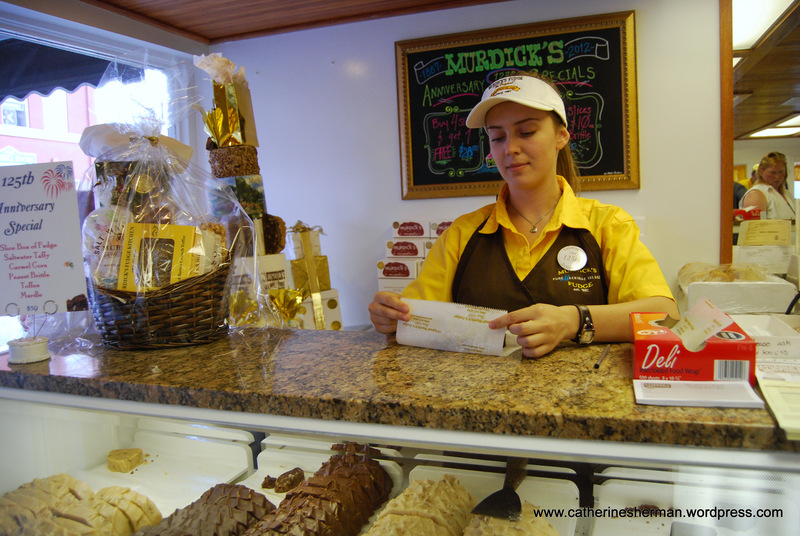 The island is famous for its lilacs and fudge. The island was the second U.S. National Park, after Yellowstone National Park, but it was turned over to the state of Michigan. Now, eighty percent of the island is Michigan State Park. 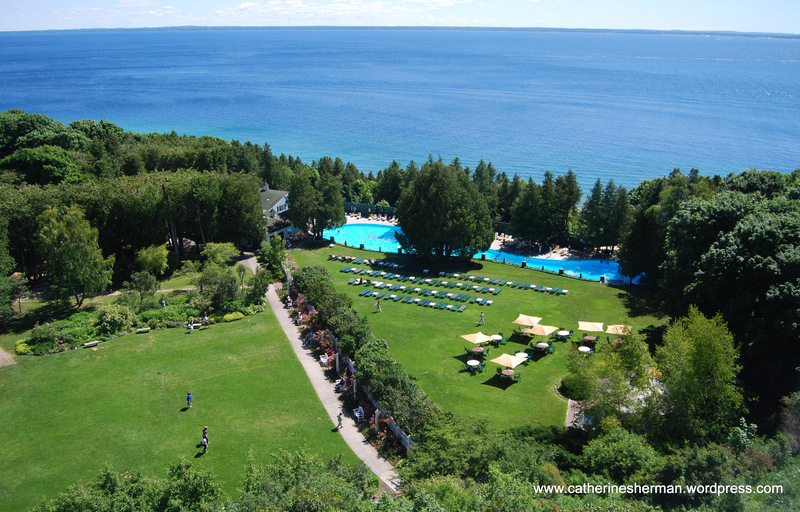 Opened in 1887, the Grand Hotel is celebrating its 125th anniversary this summer. Five U.S. Presidents have visited: Harry Truman, John F. Kennedy, Gerald Ford (who was raised in Michigan and helped to build cabins on the island as a Boy Scout) George H. W. Bush and Bill Clinton. Thomas Edison demonstrated his phonograph for the public for the first time on the hotel’s porch, as well as demonstrating other new inventions during Edison’s frequent stays. Mark Twain spoke frequently at the Grand Hotel during his speaking tours. In recent years, Russian leaders Vladimir Putin and Dmitri Medvedev have visited. 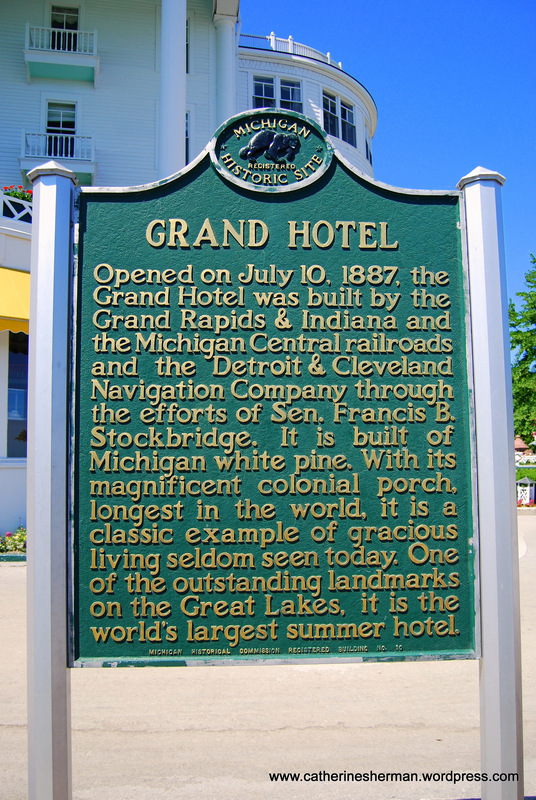 The Grand Hotel, opened in 1887, is the largest summer hotel in the world and has the world’s longest front porch. The Grand Hotel is a National Historic Landmark and is considered by many travel experts to be one of the best hotels in the world. 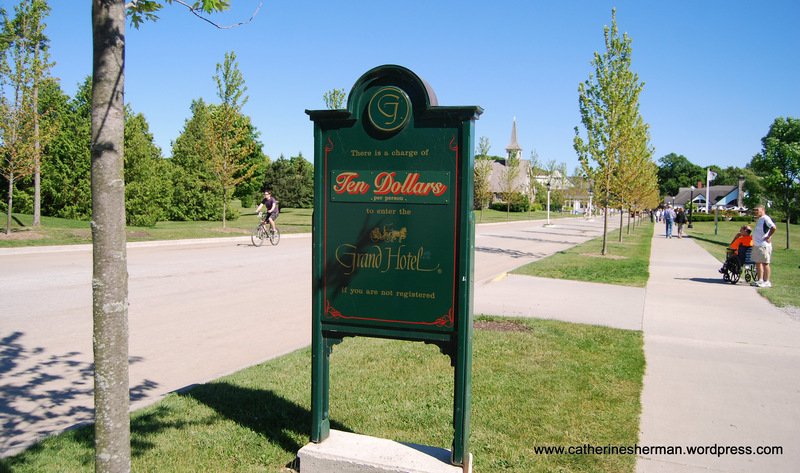 We didn’t stay at the Grand Hotel (maybe some day), but we did pay the ten dollars each to visit the hotel and grounds. The fee was instituted last year, probably because without the fee the hotel would be swarmed with the thousands of day trippers from the mainland who could take all of the seats on the porch. It may be the longest porch in the world, but it can’t fit everyone! 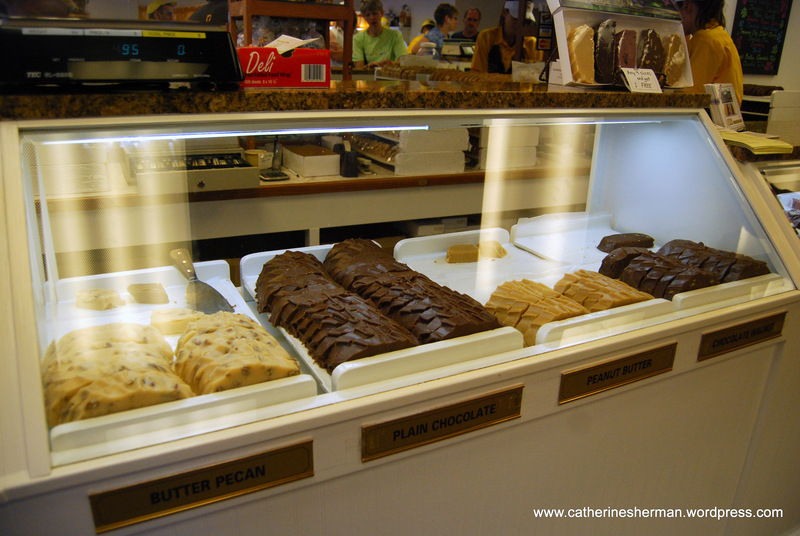 Links below take you to more information about the hotel and the island, plus there’s a link to my post about Mackinac Island fudge. Here’s rush hour on Mackinac Island, Michigan. These carriages are passing by the Grand Hotel. There are about 500 horses on the island at peak tourist season in the summer, mostly Percheron and Belgian Draft horses, our carriage drivers told us. The carriage horses work a few hours every other day in the summer and rest all winter on the mainland. 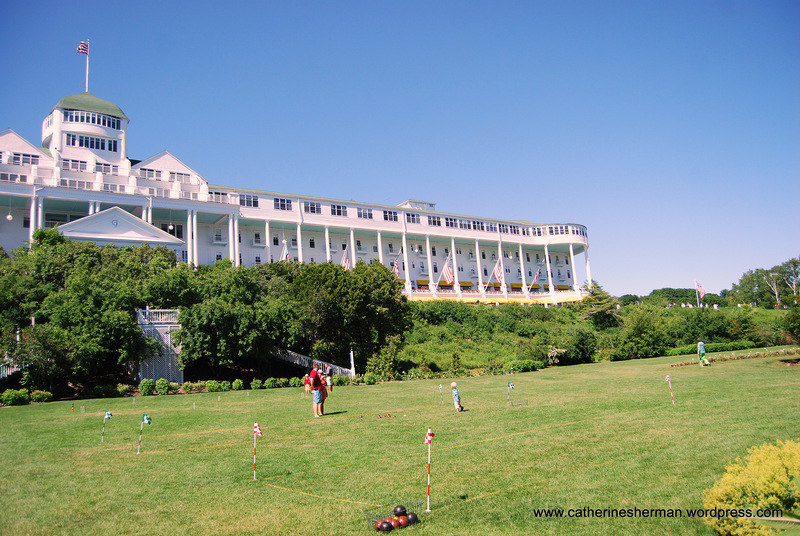 A family plays croquet on the lawn of the Grand Hotel on Mackinac Island, Michigan. 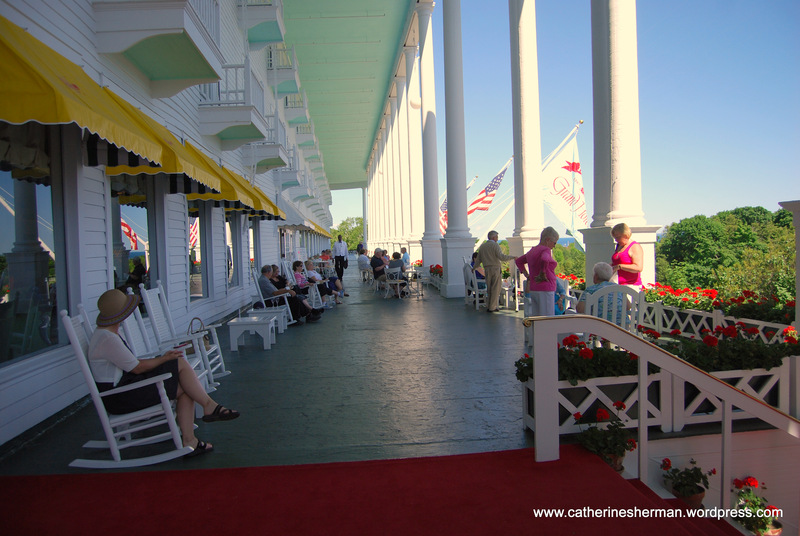 Here’s one section of the porch of Mackinac Island’s Grand Hotel, the longest porch in the world. You can see the Grand Hotel’s signature red geraniums in the flower boxes and on the steps. 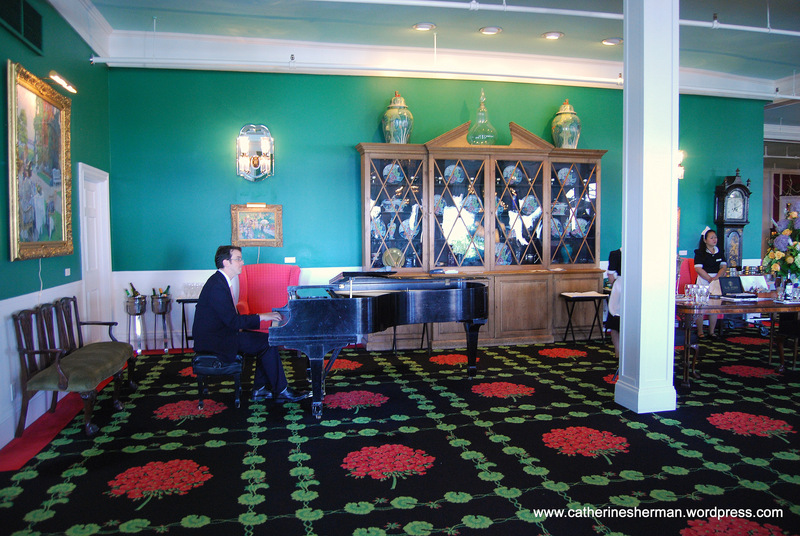 A pianist entertains guests during tea time in the lobby of the Grand Hotel on Mackinac Island, Michigan. Note the design of large red geraniums in the carpet. Interior designer Carleton Varney designed the Grand Hotel in its late 19th century decor including its Pelargonium geraniums. 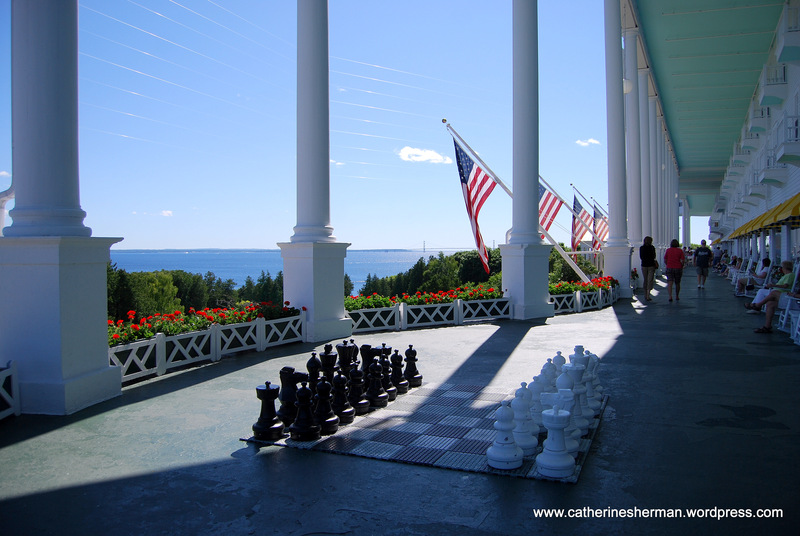 A large chess set is ready for play on the porch of the Grand Hotel on Mackinac Island, Michigan. On the horizon is the Mackinac Bridge, which connects the Upper and Lower Penisulas of Michigan. The 1947 musical-comedy “This Time for Keeps” was filmed at the Grand Hotel. The movie starred Jimmy Durante and Esther Williams, and the hotel’s pool is named after Williams. Williams was a frequent guest at the hotel, one of our guides said. 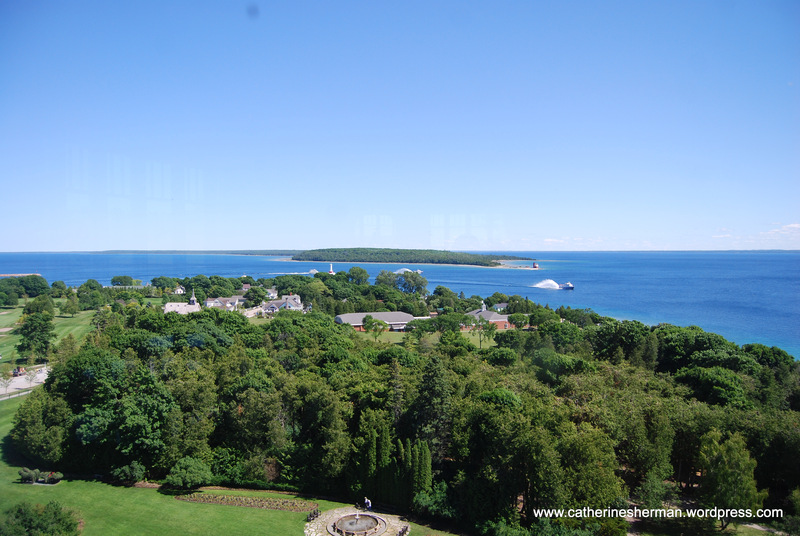 This view from the Cupola Bar at the top of of the Grand Hotel shows the hotel grounds, Mackinac Island town and the ferries making their way across Lake Huron from the island to the mainland. A restaurant in the Grand Hotel. 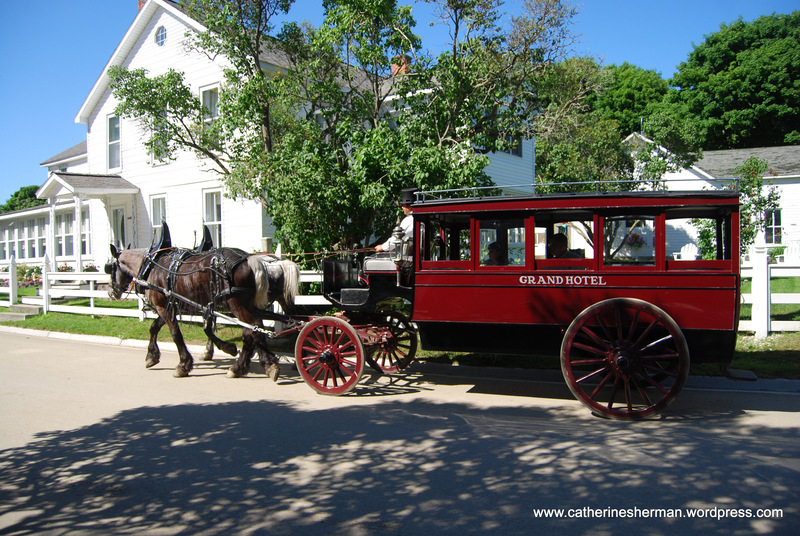 A carriage delivers passengers to the Grand Hotel on Mackinac Island, Michigan. 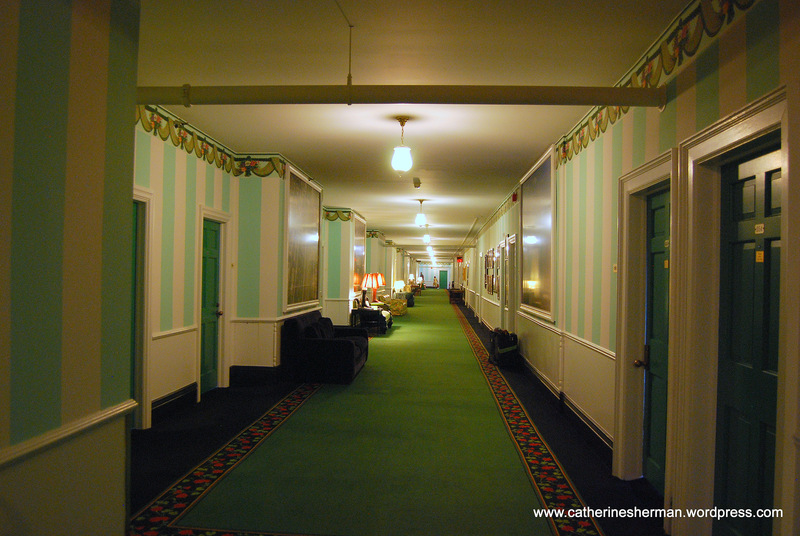 Interior Designer Carleton Varney designed the late 19th century interiors of the Grand Hotel. All of the 385 guest rooms have a different design. 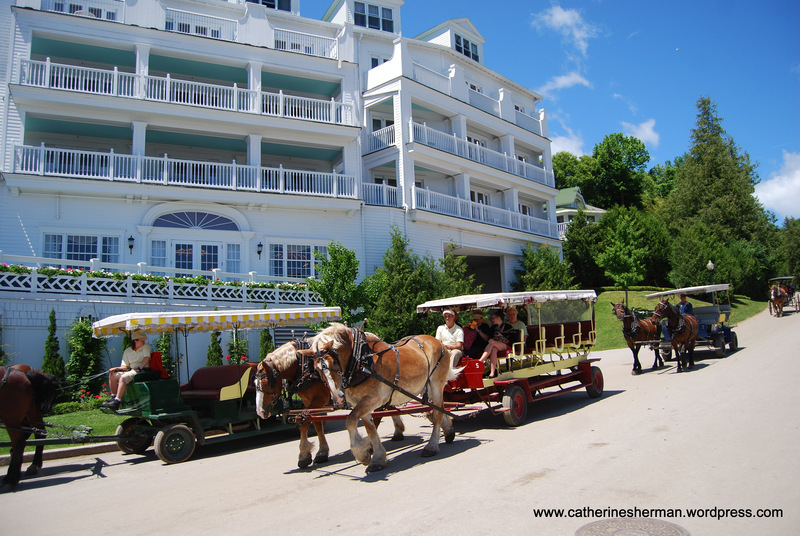 A carriage takes guests to the Grand Hotel from the ferry landing on Mackinac Island, Michigan. 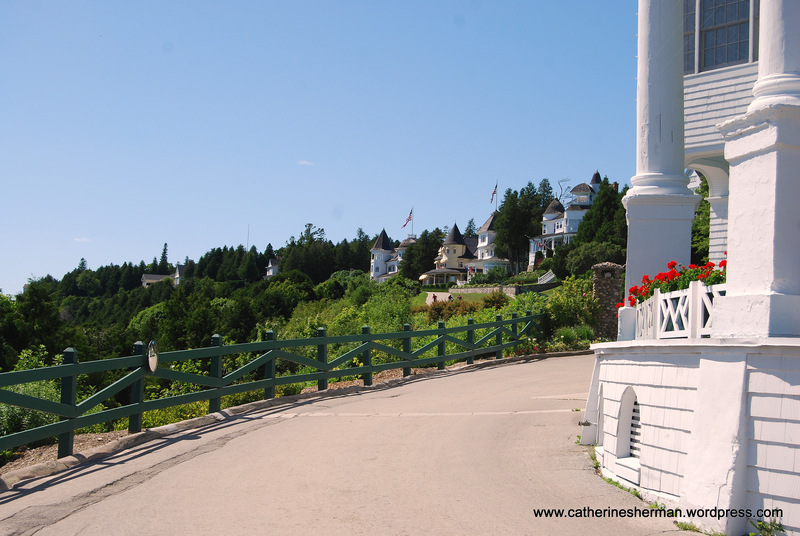 Summer houses line West Bluff Road just beyond the Grand Hotel on Mackinac Island, Michigan. Unless you are a registered guest at the Grand Hotel, you must pay ten dollars to tour the hotel and grounds. 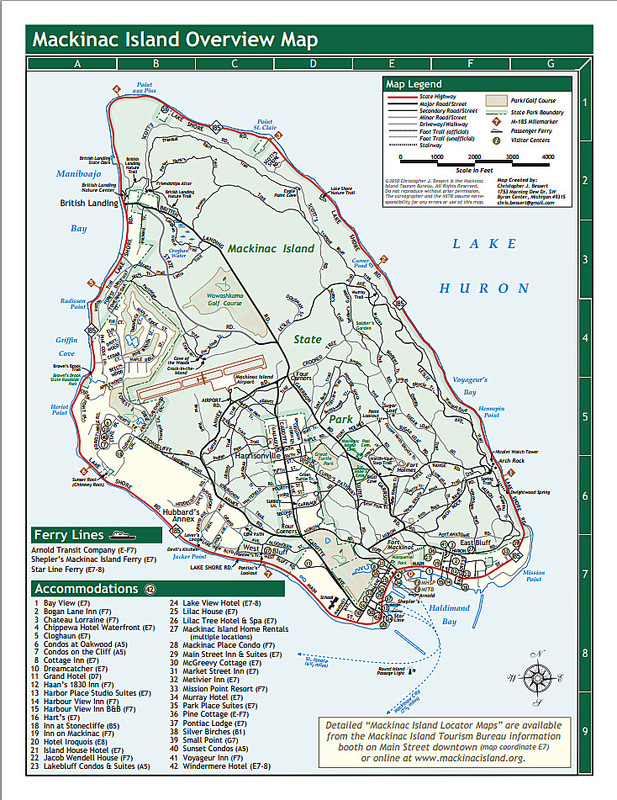 Map of Mackinac Island, Michigan. About the “Somewhere in Time” movie. 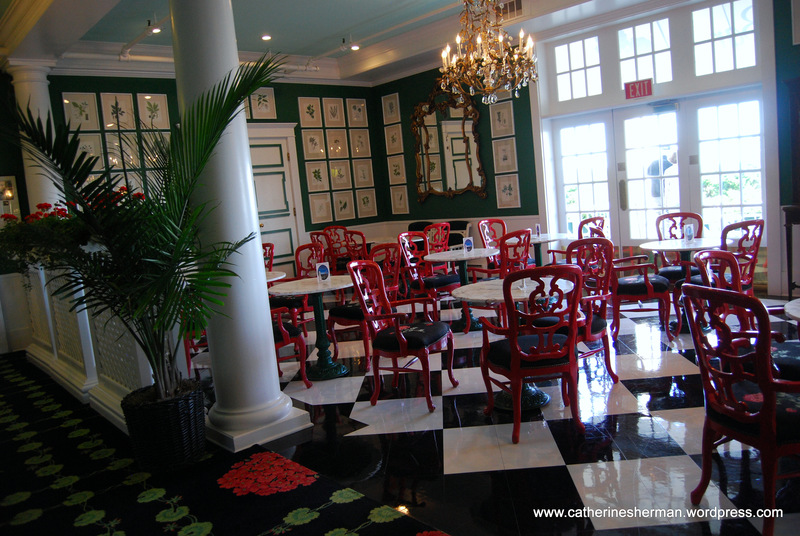 About the Grand Hotel on Mackinac Island, Michigan. Views of some of the beautifully decorated rooms can be seen here: Official website of the Grand Hotel. 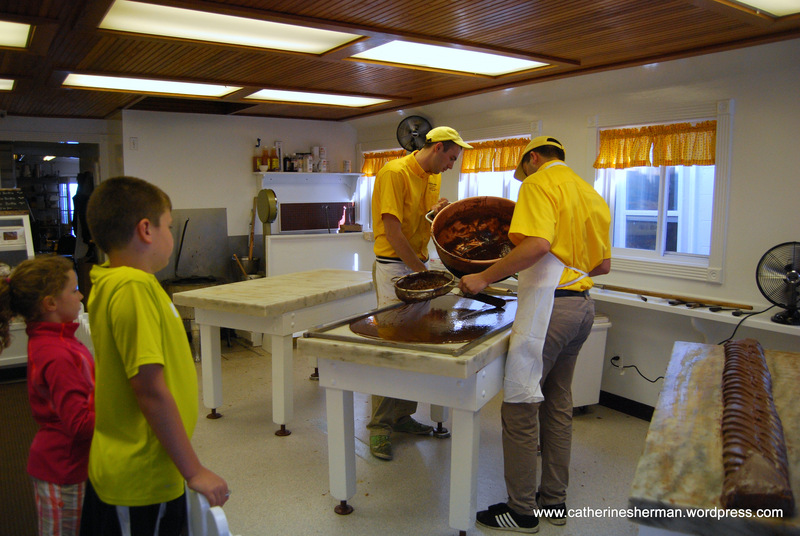 My post about Mackinac Island Fudge. 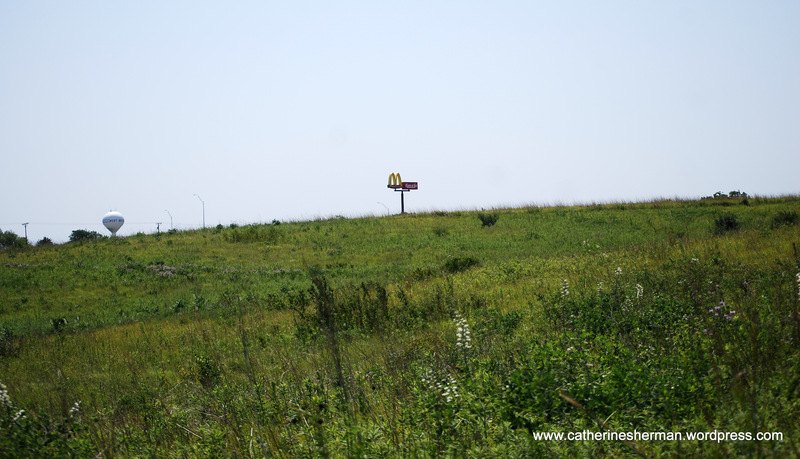 A sign featuring the McDonald’s and Kum & Go businesses marks I-80 highway on the southern border of the restored 81-acre Tallgrass Prairie at the Herbert Hoover National Historic Site in West Branch, Iowa. To the left is a West Branch water tower. A few miles farther east in Walcott is the Iowa 80, the world’s largest Truck Stop. On a driving trip in June, my husband and I visited another remnant of Tallgrass Prairie at the Herbert Hoover National Historic Site in West Branch, Iowa. The restored 81-acre prairie is just north of I-80 in the eastern part of Iowa. Nearby is the grave site of Herbert Hoover and his wife Lou. A block away is Hoover’s birthplace cottage, which is in its original location. There are also several 19th century buildings, including houses, a school, Quaker meeting house and a blacksmith shop. Black-eyed susan wildflowers are among the dozens of wildflowers that were re-introduced to the restored Tallgrass Prairie at the Herbert Hoover Historic Site in West Branch, Iowa. 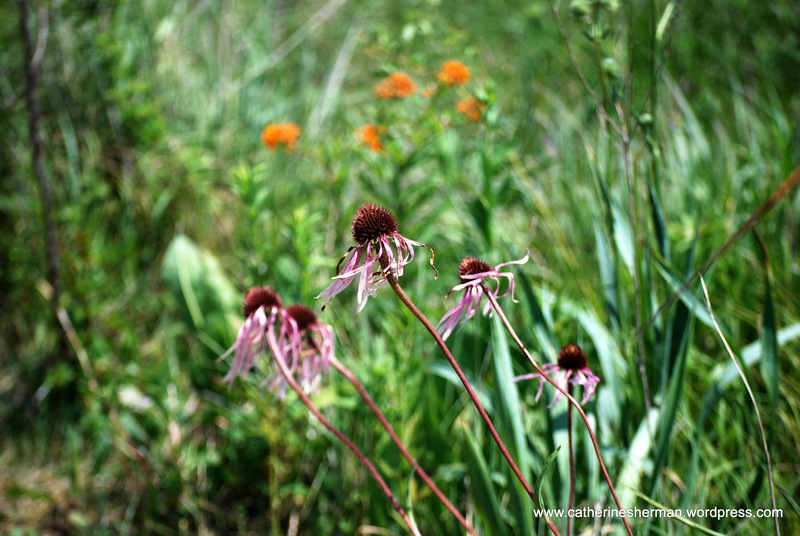 Coneflowers sway in the wind in the restored Tallgrass Prairie at the Herbert Hoover Historic Site in West Branch, Iowa. In the background are orange milkweed plants, also known as butterfly weed. 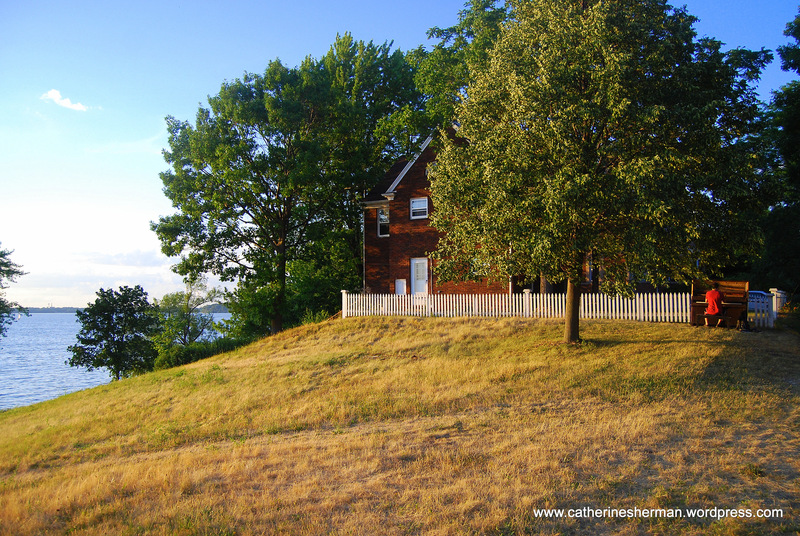 At the top is the small cottage where Herbert Hoover was born in 1874 in West Branch, Iowa. At the bottom are the graves of Hoover and his wife Lou, which are near the Herbert Hoover Presidential Library and Museum. 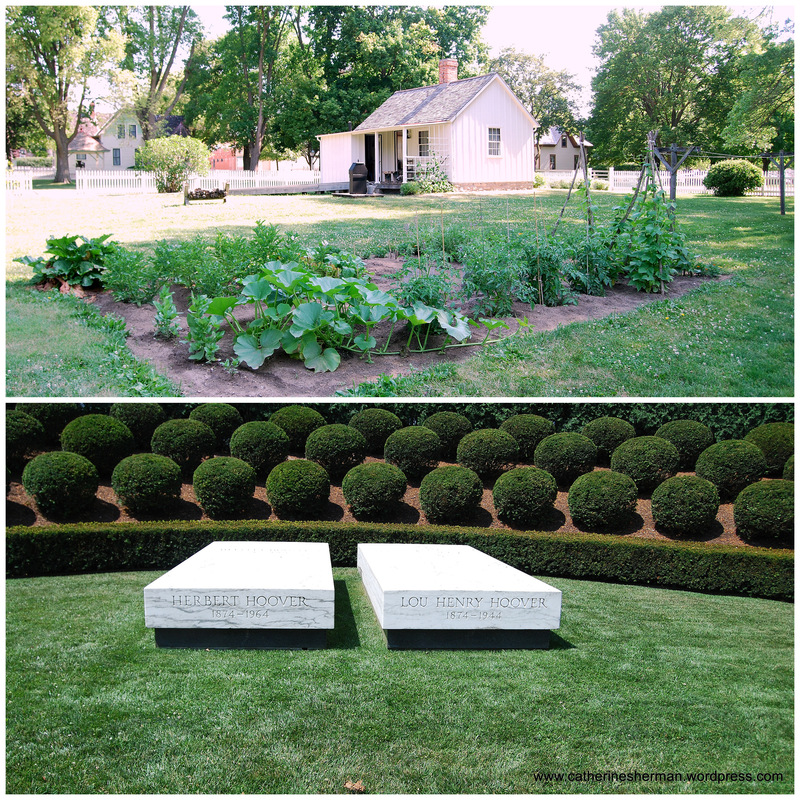 The graves are about a block from the Hoover birthplace cottage. 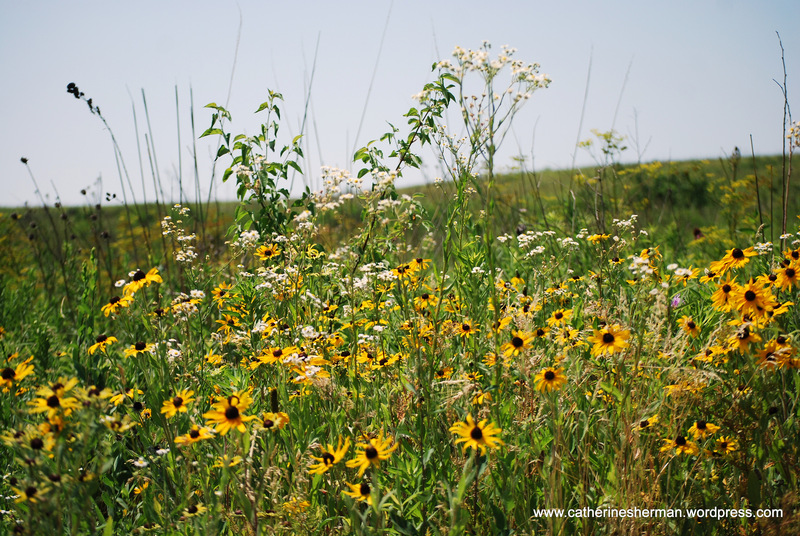 About the Tallgrass Prairie National Preserve in Kansas. Plants at the Tallgrass Prairie at the Herbert Hoover Historic Site in West Branch, Iowa. Iowa 80, world’s Largest Truck Stop. At the right, a young man plays an old piano sitting in a yard overlooking Lake Mendota in Madison, Wisconsin. While wandering the shores of Lake Mendota in Madison, Wisconsin, this June, I heard ethereal piano music that seemed to be coming from on high. I tracked it down. On a hill above the lake shore, a young man was playing beautiful melodies on an old piano in a yard. Sadly, the piano seemed to be set out for trash removal when it still had some life in it. Not far away, an old mattress reclined against a tree, likely awaiting its final rest in a landfill. Although, the piano was missing parts and looked worn, the young man was able to produce lovely music from its keys. 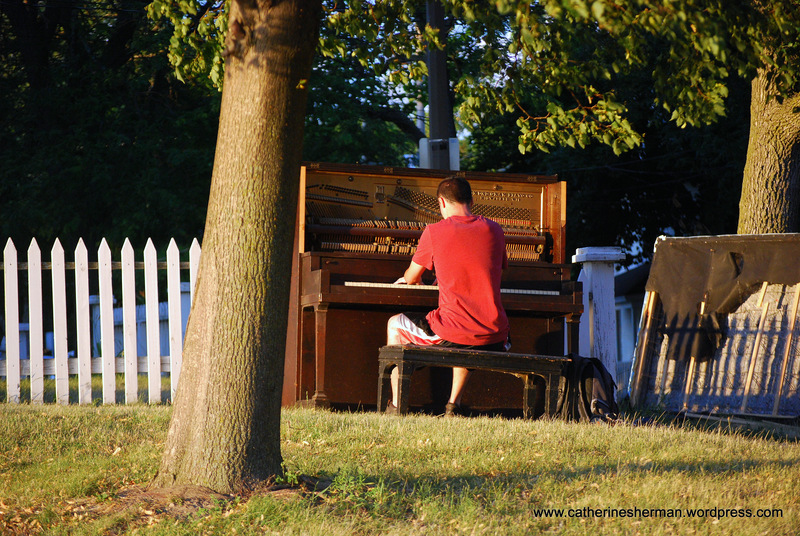 A young man plays an old piano that seems to be set out for the trash in Madison, Wisconsin. 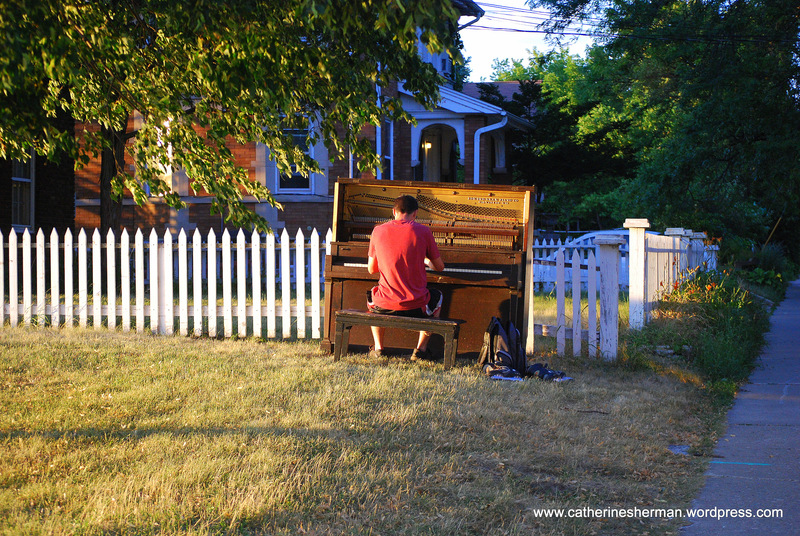 A young man serenades a neighborhood with lovely music on an old piano in early evening in Madison, Wisconsin. The Edmund Gram Piano Company of Milwaukee, Wisconsin. I love this view of one section of Kansas City’s Kauffman Center for the Performing Arts, juxtaposed between an unrelated mural on the left and the Denny’s sign on the right. I took this photo from my car window while stopped at a red light in June 2012. We were on our way to a wedding reception in the nearby Crossroads District of Kansas City. The Kauffman Center offers two performance venues. 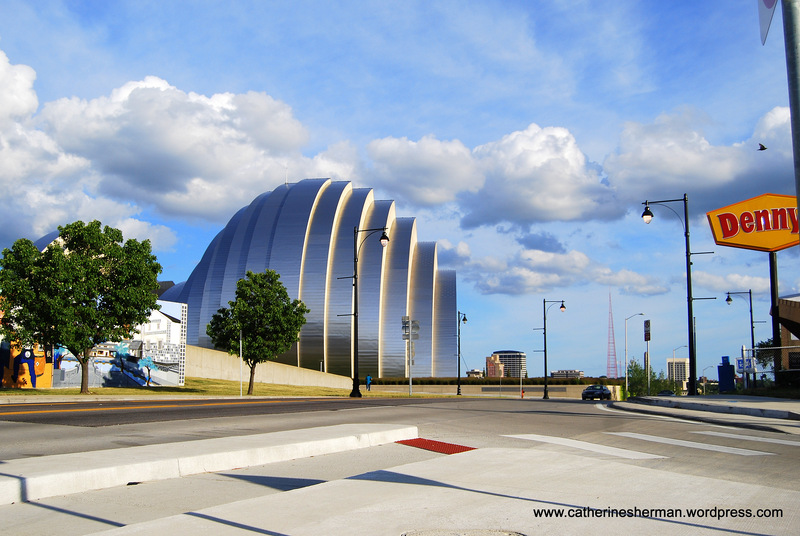 The Kauffman Center for the Performing Arts in Kansas City, Missouri, is an artwork in itself. This photo only shows the west shell (wing) of the building, but the east shell looks similar. Shell seems like the right word for the wings, because the building does have a creature-like appearance. I thought of an armadillo when I first saw it. When my husband stopped at a red light as we drove near it on our way to a wedding reception in June, I quickly took the photo. Sometimes, long red lights are a good thing! My friend Jan and I had recently driven past the Center when she visited from Los Angeles, so Jan, here’s another view! The two wings (Muriel Kauffman Theatre and Helzberg Hall) are designed for the needs of opera, dance and musical performances. The Kansas City Symphony, the Lyric Opera of Kansas City, and the Kansas City Ballet perform in the Center. The Kauffman Center opened in September 2011, and a month later, friends invited my husband and me to a performance of “Jazz at Lincoln Center Orchestra with Wynton Marsalis” in the glorious Kauffman Center. It’s time we went back! Kauffman Center for the Performing Arts Website. Wikipedia on the Kauffman Center for the Performing Arts.